Sonic Leak Detection is New Mexico's affordable leak solution. Sonic Leak Detection is New Mexico's affordable leak solution. We are a locally owned and operated business in Santa Fe. Our technicians have more than 10 years of experience specializing in residential and commercial leak detections & repairs. We provide services from plumbing leaks, roof leaks, pool & spa leaks, irrigation leaks, sewer inspection, thermal imaging and even that unknown water intrusion. Like everyone else we have competitors, but what separates us from them is none of them specialize exclusively in leak detection. At Sonic Leak Detection, this is all that we do, no other firm in New Mexico has made a comparable investment in both equipment and research development. There is no other firm which offers our guarantees or quality of service. 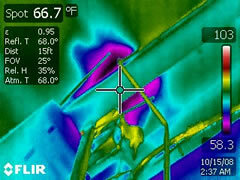 Bottom line, our all-in-one service will resolve your leak issue in a quicker, cleaner, and less expensive solution. If you think you have a leak, your best solution is to call Sonic Leak Detection at 505-982-8414. We will save you money and unnecessary damage. 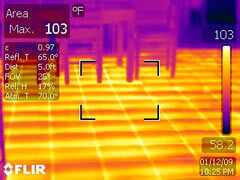 Learn how thermal imaging can save you money and how it can help.